With the cobbled classics done, time for the Ardennes? Yes and plenty more. 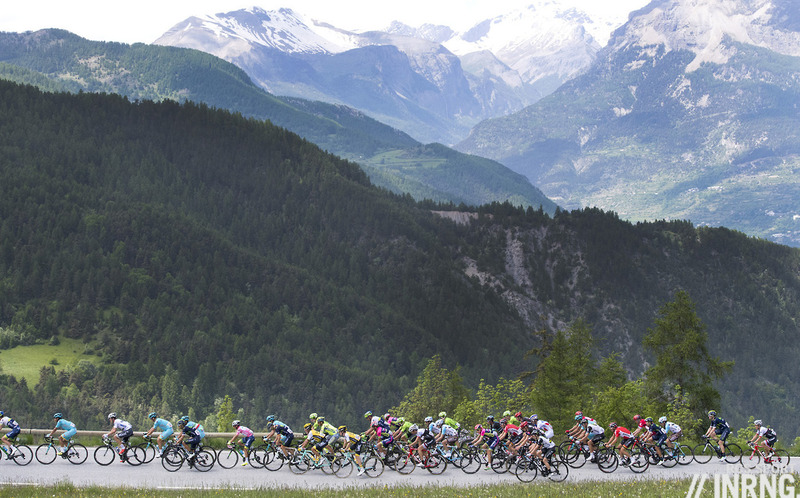 With just over three weeks to the Giro it’s a good time to take a quick look at the contenders and pretenders for the race and see where they are, especially given the news that Fabio Aru is out with a knee injury. Fabio Aru is the first to fall off the stellar start list. He crashed in training sustaining a knee injury which has disrupted his training and after meeting a doctor yesterday he was told to rest for ten full days and as you can imagine not being able to ride for such a long period so close to the Giro has ruined his plans for May so he and the team have decided to scratch the Giro. He’ll probably focus on the Tour de France but this isn’t an easy switch, a “nevermind, we’ll focus on July” instead story. For Aru it means missing the grande partenza on his island of Sardinia and there’s also the chance to reset his goals after an invisible Tour last summer and a discreet start to the season so far, the Giro might have been within reach but the Tour de France surely remains a level above for him? It’s also a blow for the Giro and Italian fans because for all the foreign stars in attendance it needs local champions to get the crowds out and Aru helped suppy that, he’s not a huge name in Italy but he, the Giro and RAI TV need each other. It also leaves the Astana team orphaned for May, the likes of Moreno Moser – remember him? – and Michele Scarponi will have to be stage-hunting. Vincenzo Nibali is the “defending champion”. Only you can never defend a race, Nibali won’t start in Sardinia with anything to protect, if anything it means expectation and pressure. A repeat isn’t obvious despite winning the Giro in 2013 and the Tour de France in 2014 too. His win last year was like a three week hurdle race where he went into the finishing straight in fourth place only for the three competitors ahead of him to trip and fall (Kruijswijk crashed, Chaves fell ill and Valverde’s only weakness seems to be long climbs/high altitude) leaving the path open for his surprise victory. Now he has had a quiet start to the season too with no results to talk about or show his new boss. After he quit Tirreno-Adriatico his coach Paolo Slongo told the press that Nibali was two kilos overweight, an amount that can be shifted in time but not easy when you’re trying to build form at the same time. All together it leaves Nibali on the back foot but perhaps that’s how he likes it, some of his best rides have come when he’s been able to surprise, to turn the tables, to gamble. 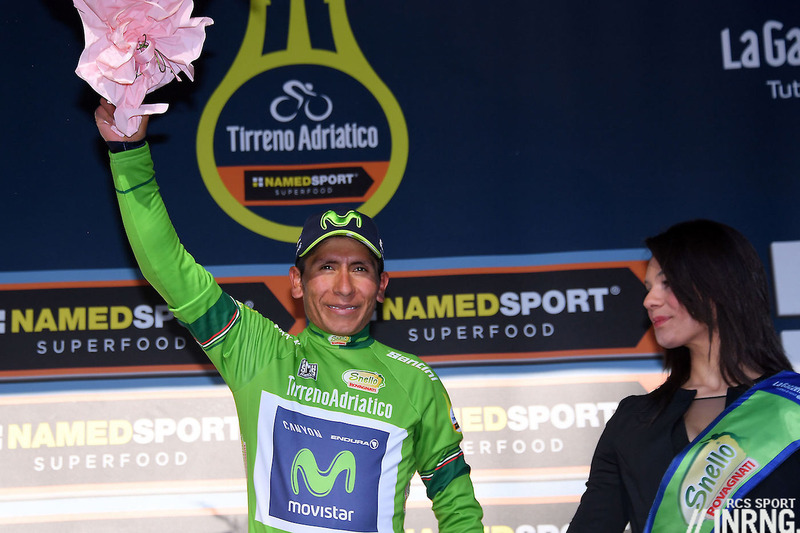 Nairo Quintana is the bookmaker’s pick and you can see why. He’s won this race before and if there was controversy on the day he rode into the maglia rosa because of confusion about the snow and the neutralisation, he stomped over the rest of the race to prove he was the best. More recently he won the last grand tour he rode, the Vuelta. 2017 has been a story of “so far, so good” for The Condor of Tunja as he won the Volta a la Comunitat Valenciana and Tirreno-Adriatico and his loss in the Abu Dhabi Tour was partly down to him and Alberto Contador watching each other too much on the summit finish rather than getting stuck into the gradient. Let’s remember he’s aiming for the Tour de France too, the idea being that Movistar believe it is possible after seeing Alejandro Valverde’s data. Whether this works or not remains to be seen but the Giro-Tour double has long been a matter of fashion, in vogue when it works and then as soon as someone flops it’s shunned. Either way the doppio implies a certain strategy to the Giro, that Quintana will need to manage his efforts rather than “fight for pink” daily but easier said than done given the rivals and the course where two substantial time trials (39.8km and 27.6km) won’t help him, he’ll need to raid the mountains for minutes. Also on the subject of doubles it’s been said that few have achieved the Tirreno-Giro double – Nibali 2013 – but that’s really because March’s race was traditionally a flatter race for riders prepping for the classics, it’s only in this decade that it’s tried to attract the grand tour contenders. One minute you’re on top of the world, the next everything crumbles. 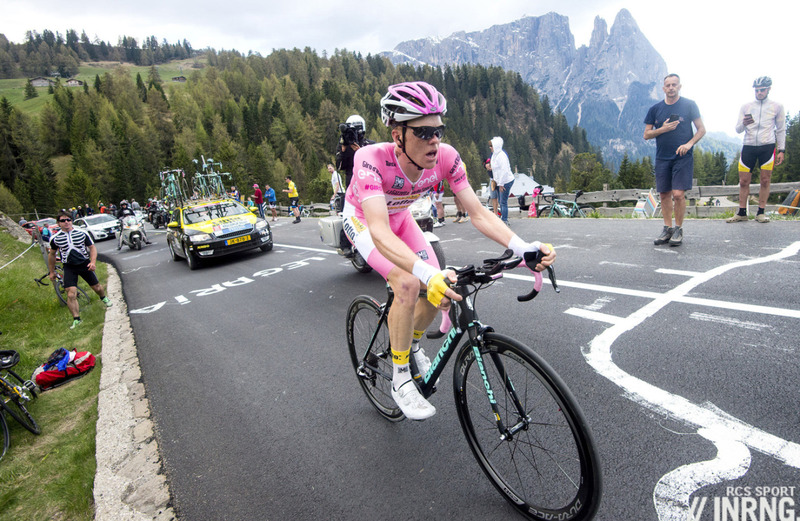 Steven Kruijswijk got a cruel lesson in life on the Colle d’Agnello when one mistake saw him collide with a bank of snow and left him floundering. While we remember the accident the real story was that he was leading the race with three minutes on his nearest rival so if he can return with the same legs then he’s got every chance of keeping the maglia rosa on those coathanger shoulders. The season has been quiet so far but that’s always been his way with quiet rides in Paris-Nice and Catalonia and the Tour of Yorkshire before showing up ready for the Giro. 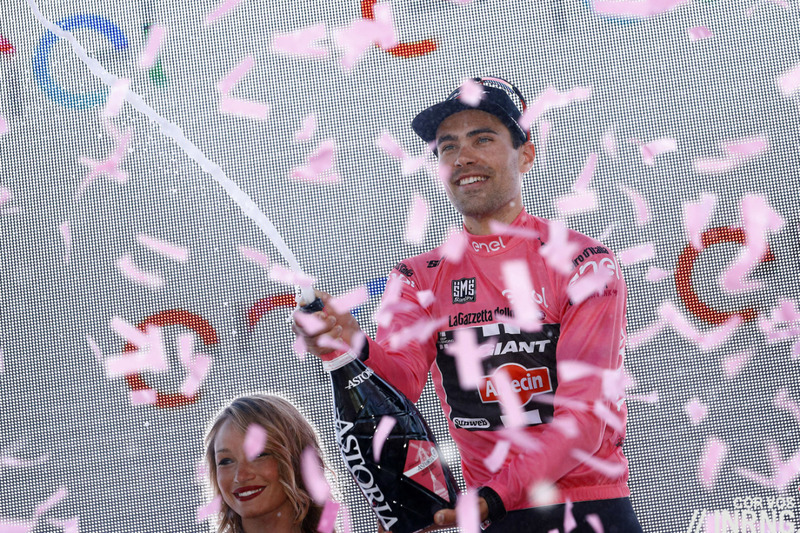 Fellow Dutchman Tom Dumoulin is making his first public bid for grand tour GC glory. He’s long been an exciting rider but was the surprise of the 2015 Vuelta a España and became hot property. He orientated his 2016 season around the time trials, especially the Olympics only for him to crack his wrist in the Tour de France although only after winning a mountain stage and a time trial stage. Now it’s all in for the Giro. He’s had a good start to the year with a string of top-10s in the few times he’s raced but the real test is the high mountains to come in the Giro and it’s conceivable his plan is predicated on taking the maglia rosa after the Stage 20 time trial and not before, an usual symmetry to him taking the race lead on the first day last year. Interestingly he’s got Wilco Kelderman by his side, still a prodigious talent but just months younger than Dumoulin and with a thinner palmarès and also fewer results and races this year, after doing the early season in Australia there’s only a DNF in the Strade Bianche to his name. Another team with a pairing is Sky who bring Geraint Thomas and Mikel Landa. Thomas looked convincing in Tirreno-Adriatico but his challenge is consistency over the three weeks of a grand tour, he’s ridden high in the Tour de France only to fall back in service of his leader for the final week but this time he’s in charge. Landa’s looked more erratic this year but that’s his style, we’ll know more in the upcoming Tour of the Alps, the new name for the Giro del Trentino, which he won last year. Collectively we’ll see how Sky fare because they’ve consistently come undone in the Giro despite several attempts at the win. 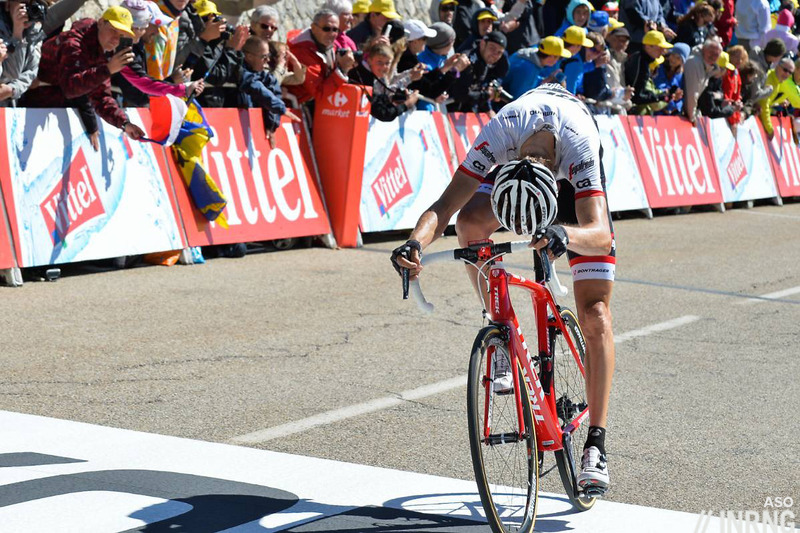 Bauke Mollema is another rider who needs a solid three week showing. He was a genuine podium contender in the Tour de France last summer only to crash and fall out of contention late in the race and during this time his team was busy signing Alberto Contador which explains Mollema’s new Italian focus. He won the early-season Vuelta de San Juan and has been consistent but not stellar since. His problem is that he might have opted to ride the Giro to get a long-due result only to find so many others have opted for the same plan meaning the podium is going to be crowded. Like many promising Americans Tejay van Garderen has suffered from hype. This isn’t his fault but it’s brought pressure and expectation. He’s still got a big engine who can climb with the best on his day and perform very well in the time trials and he might find the Giro’s more relaxed ways make for a calmer three weeks; yes the descents can be trickier and the roads rougher but he won’t have microphones thrust in his face all the time. 2017 has been quiet results-wise, the most visible action has been tweeting complaints at Movistar over the Catalonia time trial result. If TvG found cohabiting with Richie Porte awkward he’s now going into the Giro with an Australian co-leader called Rohan Dennis. Dennis is slowly trying to become a grand tour rider and we’ll have to see what he does in the high mountains, his 15th place on Monte Terminillo in Tirreno-Adriatico was solid but not super, especially on such a steady climb ridden at a high tempo, the ideal kind of scenario for him. Pressure? For everyone asking for TvG’s time in July, multiply that by ten for Thibaut Pinot every July. Perhaps that’s one reason to ride the Giro instead of the Tour despite riding for a team where the F in FDJ means Française. Still it’s a decision the French should applaud given he’s got good results in Italy already and prefers the cooler, damper conditions of May to the furnace heat of July plus as luck would have it the L’Equipe TV channel has bought the French broadcast rights meaning for the first time in ages it’ll be free to air in France. 2017 has been going well for Pinot, third overall in Tirreno-Adriatico despite an off-day on the Terminillo climb and he beat Contador in a summit finish on the Alto Peña del Águila in the Ruta del Sol. Now he’s back from a training camp in the Canary Islands but Gran Canaria not Tenerife, a deliberate decision to avoid meeting his rivals every day so he can do his own thing with a core of team mates. The Yates brothers are gradually getting better and are now regularly in contention to win stages from the front group but both still need improvement in the time trials so if a top result isn’t certain, they should still entertain. Adam and Simon are subtly different riders but as a combination they’re even more interesting especially as Orica-Scott are open to playing some more risky tactical cards. Finally Ilnur Zakarin cuts a lanky figure but a discreet media profile. While everyone remembers Kruijwijk’s collision, the Stork of Tatarstan also crashed out and was arguably within reach of the podium too in what was his first crack at the GC in a grand tour. The lesson was that he can do it and he’ll be back for more and this time on a course that suits him more thanks to the time trials. He’s been there and thereabouts in the results, notably second in the Abu Dhabi tour and has been quietly training on the roads of Cyrprus, his adopted home. Any other contenders? Domenico Pozzovivo is a perennial outsider. Bob Jungels is going to be good to watch. Cannondale-Drapac have Pierre Rolland, Davide Formolo, Michael Woods and Joe Dombrowski for mountain stage wins but the overall looks elusive. UAE-Team Emirates have Darwin Atapuma for the mountains too with Rui Costa along for the ride and it’s not clear yet if he wants the GC or some stage wins, he’ll be one to watch in the Ardennes. For all the names cited above the work is done, the next three weeks are all about adding the finishing touches to form and testing themselves, be it on the side of a volcano or in the Ardennes and Alps. Sounds plausible at the moment. As well as the order I wonder what the time gaps will be, will it be a close race going into the end of the race? A worry is the early summit finish on Etna is so selective the race hierarchy gets established early, this happened in 2011 when Contador put almost a minute into his main rivals. Strong field this year compared to most other years where the Giro has a very weak field. “Very weak”? Outright false, unless you got stuck in Armstrong’s era. Since 2008 included, the Giro has been having pretty much decent starting fields and final top-tens. After OP, the Tour hasn’t been having great final top-tens, either, except 2015, I’d say. You might add 2013 on paper (the worst Contador in years notwithstanding) plus ex post (I’ve got huge consideration for Quintana but he got 2nd and he was a *neopro*). Some years in particular were especially poor and the quality which finally emerged wasn’t superior to the Giro’s, albeit, generally speaking, it’s true that the Tour level is better. It was also a generational thing, at the Tour you had a lot of wannabes which were regarded as good riders because they could make a top-ten in the Tour but who never proved to be able to do much more, at the Tour or anywhere else. OTOH, most top riders of that period also came to the Giro, too, going for the GC, and not always getting better results in Italy than in France. If you look at the “middle class” which makes up the TdF top-ten (or podium, sometimes), you can use as a benchmark the likes of Rolland, Van den Broeck, Henao, Samuel Sánchez, Purito, Kreuziger, Nieve, Leipheimer, König, Sastre, Basso and Cunego (in 2011 TdF vs. 2012 Giro)… they all tested themselves in both races in similar periods of their careers and the results don’t depict such a difference in final placement to make you imagine a much weaker field in any of the two GTs. Even now, Froome is the *only* TdF winner since Landis who didn’t try a shot at the Giro’s GC. If you look at the TdF podiums in the last decade, besides Froomey the Giro couldn’t have at the start (and seriously going for the GC) only Bardet, F. Schleck, Peraud and Kohl. Bardet himself would ride, if he could, and it’s probably the only name you’d really long for in recent years. The rest, no offence intended, doesn’t look like a great loss. Big names? Quintana and Contador have been racing, not to speak of Nibali. Yes, Porte wasn’t memorable and won’t be back – he shines (?) at the TdF, but that says more about the Tour’s level than about the Giro’s. Anyone else among the *greats*? Voeckler? Gesink? … Van Garderen?! Come on. Yes, we all know that Bretagne Classic – Ouest-France is a bigger race than the Giro and much harder to win. And Quebec is bigger and better than the World Championships. Good ‘statistics’. …two injured riders whose mere presence on the startline is yet to be confirmed (Chaves and Aru)!!! That has been TdF’s history in recent years, two or three of the top dogs but a worrying lack of proper value to fill in the position from 4th to 10th, that is, no significant rider/captain who might seriously go on the attack (without waiting the last 10′) and thus shape a more competitive race. Have a look to the last three Giros: Quintana, Contador, Nibali, Valverde, Kruijswijk, Chaves et al. were attacking from far, but there often was somebody up there with them – or against them, when they were left behind – to add weight to the action: maybe the latter don’t even get a podium, they make the top ten or so, but that’s a quality field. Agreed, this list of Giro contenders highlights how few bona fide challengers Froome will have this July. I think the Anonymous commenter will say that the Tour’s podium is “very weak” after all is said and done! TDF is boring – “no needles” SKY Cortisone-TUE TEAM kills the race before it starts. And it repeats for years. Compare it to the last Giro or Vuelta’15. That was a Racing! That were tracks, mountains, creative stages. “No huge names” just real fighters and real fight, drama, heart and sweat. TDF has only its doubtful prestige which is – since Riis, LA, LA-ndis – seriously wrecked and add Wiggins with his TUES, not to forget about 2x TUES for Froome… TDF is a shame for cycling yet we all try not to see this golden calf is a tombac. And I don’t want to offend anyone or any race, but can’t we really see and read who took TUEs and when? It’s still the same game MR.Brailsford! Any idea how I can watch the Giro in the States? Last year it was on Bein. Velonews is saying it will be on Fubo.tv, never heard of that. Zenmate is the VPN we’ve been using to watch RAI TV in Italy, whether its RadioCorsa or racing usually broadcast on RAI3 or RAISport1 or 2. Adding Eurosport Player can be done and watched via the same VPN if you fancy annoying British commentary from the likes of Carlton Kirby. In Eurosport’s defense we do like the Italian commentary there with Salvo and Riccardo. Thanks for the info. all – I’ll be trying to watch this in Malaysia (at least the time difference favours me). Does anyone know of a good free VPN? If you use Chrome, there is a free and reliable VPN called Hola. Still upset about Kruijsie losing the maglia rosa last year with such a big margin, so close to the finish. Especially after late Dumoulin’s collapse in the 2015 Vuelta. Think Quintana will put minutes into the latter (which he could take back in the TT’s), but have high hopes Kruijswijk can follow the Colombian. Going to be a very interesting Giro once again with a very a interesting field. Would love to see Dombrowski make a serious move in the mountains and get a top 15 result! I don’t know about that. I mean he did finish 11th on a stage in the Tour of Utah last year, but it’s a lot harder to finish top 15 on a Giro stage. What? Are you guys kidding? The guy took 3rd on Stage 20 of the Giro last year and was probably the strongest guy on the day. Also 8th in the uphill TT. I think this sort of riding suits him better than GC ambitions anyways, his flat TT isn’t very good. Curious about this statement:” …two kilos overweight, an amount that can be shifted in time but not easy when you’re trying to build form at the same time.” I guess I don’t understand how pros train. For me, I would think that time spent building form would be a good time to be losing weight, too. Not so at the top level? This is going to oversimplify the training plans, but look at it this way. If you want to do fat burning rides, you might go long and at a moderate pace with less food along the way and during the week. 6 steady hours at moderate to high calories per hour consumption might be a good weight loss program for a week if you eat well under that calorie burn. If you want to train to sharpen yourself for a mountain stage, you might combine high speed climbing with repeated and varying intervals and jumps. (A common enough plan for some pros, it replicates trying to follow Contador and Quintana.) You might burn a lot more in an hour, and to make the jumps and intervals work you would want to have snap in your legs, and that implies more calories in your system. Here is a workout to try if you want to ruin yourself for a few days: Go do a series of speed/watts drills. Those could be nasty short intervals or hill repeats or whatever you think you would need to excel on a stage. Note the wattage outputs. Then go ride 6 hours and repeat the intensity drills exactly. Do that every day or two until you can generate nearly the same wattage at the end of the ride as you did at the beginning. (Yes, that is a plan that some pros use.) To do this for more than a day or two requires no skimping on calories. No weight loss rides for those days. I don’t know Nibali’s training, but he might need calories to build strength and speed. That means less fat burning. Man, that was a long answer. Did it make sense? That’s what I was getting at too. You need to lose calories just at the time when you need to be training hard, to be starving yourself just as you want to build form. 2kg isn’t drastic, there’s time but it’s not ideal. Also Slongo might have been presenting excuses for Nibali, it’s easier to say he’s Xkg overweight – to present a measurable solution – than to say he’s simply behind in his training or ageing etc. Do pro cyclists use the sauna as a means to aid or speed up weight loss? I read a rather disturbing article on BBC Sport recently about boxers using saunas to lose significant weight in a couple of days – dangerous but an emergency option was the jist of it. Boxers use the sauna to drop water weight in advance of the weigh in, and then rehydrate as much as they can before the bout itself. There’s no reason for pro cyclists to do the same, as dehydration significantly hinders endurance performance. Rather, they try to get their body fat as low as possible. I know of no pros who use sauna to lose weight. Some use it to relax. But the comment on dehydration is I think a good point. The only thing you lose is water which will ruin your performance when riding. For boxers or jockeys trying to meet a set target it can be done ahead of the weigh-in but not for athletes who need to perform in long endurance events. This technique is actually passive heat training, it reaps significant physiological benefits similar to those of heat training. Think increased sweat rate, increased plasma volume, decreased HR, decreased lactate for a given work rate. I don’t have any experience / knowledge of cycling training but as a comparison to a runner I’d find the explanation of being 2kg over-weight of concern, no? A runner would have done the strength and endurance work, and would be concentrating on speed, adding a little power, perhaps a tune-up race or two, in the final couple of weeks, no? If anything, this would add a touch of weight. Or do cyclists / Nibali do it differently? yes, that’s essentially it. shortest answer: weight loss requires low calorie intake, dialing in pre-race top end requires high calorie intake. they aren’t necessarily mutually exclusive, only difficult to balance simultaneously. In theory (and most likely in a laboratory setting) shedding water will give you a performance boost, even though your endurance will suffer. This works on the principle that on a climb (and almost only on a climb) your weight is more of a factor than absolute top endurance. There is therefore a point at which weighing less will offset the decreased endurance. The problem is that this is most likely a very small gap, and that controlling how much you dehydrate will be rather difficult. In practice it would most probably be too great a risk for a pro rider to actively pursue such a strategy. It’s got the potential to be a bit of a classic if all goes to plan. If Dumoulin can combine his best TT form with his best climbing legs then it could end up similar to Pantani v Tonkov in 98, hopefully going right down to the wire between he and Quintana. You never know with Nibali how he’ll fare, hopefully he’ll be in the mix too. What’s happening to the knees of these poor guys? Aru, Alaphilippe, Chaves, Poels, König, Haussler… anyone else? Good question, would love to know if there is a common theme? Crashes are a theme among some, both Aru and Alaphilippe have hit their knees in crashes recently. Aru has bursitis on his knee. Poels seems to have a longer term problem, he’s been carrying the knee injury since March when he pulled out of Paris-Nice but has kept up training. Do these knee issues seem more-than-usual? This joint has long been the weak link in the human pedaling machine. I’d say its almost more likely than not a top pro will have issues with one or the other during his career? Crash, overuse, pushing too-big-a-gear, bio-mechanical imperfections and who knows what else? They’ve always been pretty common, haven’t they? I guess if you’re trying to attack, or keep up, while climbing then there will always be a temptation to push a higher gear than is good for your knees. My sympathies to Missus J Evans. Giacomo Nizzoli’s right knee gave him plenty of trouble since December, but it would appear that he’s been gradually returning to normal training since early March. As a former marathoner (of decent AG, on the podium in a small local race if the usual suspects didn’t show up, calibre), it strikes me that road cyclists are a happy lot: were it not for injuries sustained in crashes, they would, on average, have very few days off training due to overuse injuries. Detecting a hint of sarcasm? Do you think there’s any chance that some kind of deal took place between L’Equipe and FDJ to get Pinot to ride the Giro this year? Also, on Zakarin, he can climb with the best, but at last year’s Giro showed his descending skills to be somewhat lacking. He always looked like an accident waiting to happen. Any idea if he has worked on this, as Pinot did a few years ago at the racetrack? Pinot has long wanted to ride the Giro, seems the TV rights deal is just lucky as he can lap Italy now and the Amaury family get a real audience draw for their channel. L’Equipe TV is a small channel but Pinot should help bring in a better than usual audience. 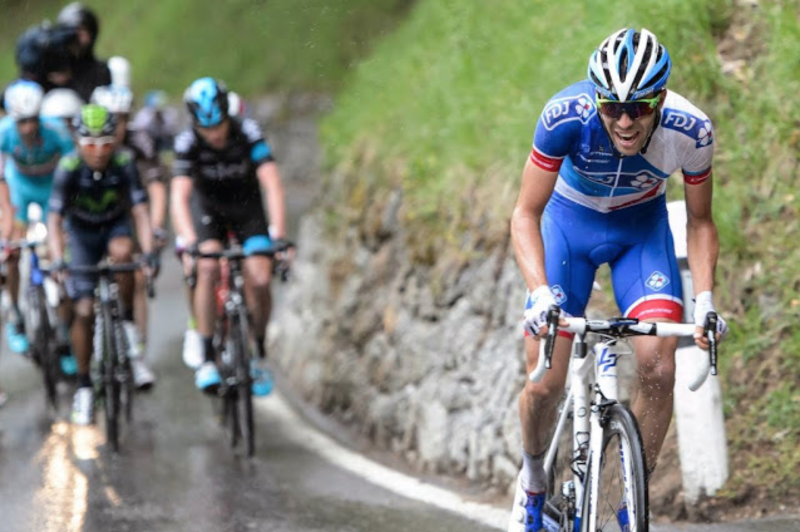 On descending FDJ do a lot of work, even hiring a descending coach. As for Zakarin, he never looks stable even when climbing but he’s one of those guys with a high centre of gravity which can’t help on the descent. I see Zakarain’s descending issues as an inherent balance problem. the way he drops his shoulders in turns and cornering, while keeping his hips more in line with his feet belies a fundamental flaw that may not be trained away. With Quintana in the mix this year (as opposed to last year’s Giro where he was absent), it’d be difficult to bet against him winning his second Giro title. He looked good last month–and assuming he is injury-free–he’ll look even better in May. The rest will be fighting over podium spots. Would like to see Q win it, and then go for the Tour-double victory. It could happen if Team Sky is disbanded prior to July because Brailsford is arrested for fraud, and then Froome is left with no team to start the TdF. That’s pure fiction, . . . but life is stranger than fiction sometimes. Is it confirmed that Quintana is going for GC ? When Movistar announced his participation I thought they said that it was to prepare for the TDF and not go for GC ! Anyway a great list of contenders with or without Quintana. I am hoping that Dumoulin and Dennis do well so organizers start doing balanced races again. More mountains does not make exciting racing (the person who won the first montain stage is likely to be the strongest and will just defend their lead). A balanced route with enough TT means the strongest climber needs to get time back on the strongest TTer: exciting racing ! We’ve had mixed messages but the latest or settled version is that Quintana is aiming to win the race, yes. But what else can you say, show up and say you’re just there for the training (while perhaps cashing an appearance fee)? 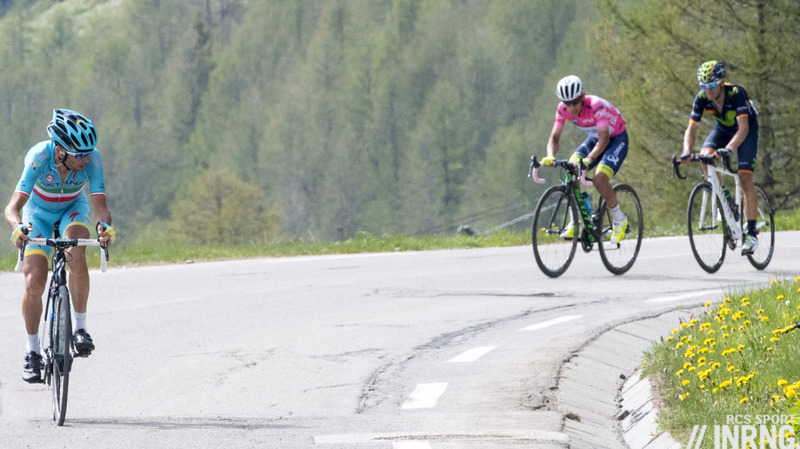 There’s a certain politeness involved, see all the sprinters who declare their love for the Giro when winning stages but will surely bail out before the Alps as they did last year. Quintana and Movistar are operating on the principle that he’s done the tour and been stronger in the Vuelta, so is better in his second grand tour of the year. Whether this holds true remains to be seen. The ASO is obsessed over the fact that TTs don’t make great television, but what they do make is awesome racing, if you have a balance between TTers who can also climb and pure climbers who suffer in time trials so need to attack in the mountains. Giving up one stage for a couple of weeks of tension to me sounds like a fair trade off, because after a while adding even more climbs only confirms who is the best climber who then wins the race by minutes. They do seem to have gone from one extreme (too many TT kms in the 90s and 00s, for instance, so that the race was usually won in those) to another. PS I haven’t really accepted the concept of TTTs, though. OK, they can play a certain minor role in forcing teams to start a more well-rounded nine (or eight or seven), but they seem to favor the bigger teams too much (or, rather, disfavoring the smaller teams) too much. I can’t escape the feeling that Quintana is doing the Giro because he doesn’t think he can win the Tour. I also can’t escape the feeling that both the Giro and the Tour might end up being non-events as NQ will dominate the Giro and CF the Tour. Here’s hoping I’m wrong. I think you can rest assured that the first idea is wrong. Plenty of examples. People have been saying that about Contador and it just didn’t make sense (just look at this season). Neither makes it sense about Quintana. It’s just not the way a professional athlete of *that* level thinks – and if they were thinking that way, they probably wouldn’t be in the position they actually are. Generally speaking, people tend to apply their commonplace mentality to persons whose mental structure – not just their physical capability – is often quite different from average, even more so in the case of top of the top athletes. If it is confirmed by specific information on the subject (a recurring behaviour, explicit declaration, some facts, in short) it’s just cheap psychology, quite misguiding most of the time. You’re probably right: I was largely seeing it from my own point of view, because that’s what I’d do – but then I utterly lack the mentality of a professional athlete. ‘This is hard – just stop’ would be the over-riding message from my brain. I only suspect it about Quintana as he seems such a timid/conservative rider – no doubt that’s Movistar’s influence. I also think, as others have intimated above, that Quintana might not actually go for GC in the Giro – we’ll see. As I say, hopefully I’m wrong about this year’s Giro: I agree with every word of your two posts above and, generally speaking, in recent years the Giro has usually been the more exciting race of the two. But races are usually better without one strong favourite – and both the Giro and the Tour have those this year. I quite much agree with this further possibility you suggest, that is, Quintana not going at his supposed absolute best or full gas or 110% or whatever we might call it. After all, that’s what was happening in Movistar’s benchmark, which admittedly was last season. Be it for health (allergies or whatever) or physiological issues (for instance, the effect of long exposition to windy racing), Quintana wasn’t actually able to go full throttle at the Tour and didn’t ever try to push hard when he looked like he could, say on the first mountains: I mean, no doubt that he was giving everything he had available, but such *everything* wasn’t his body full potential in general terms – and that makes a difference. I suspect they might try to do something along those lines at the Giro, even if the astonishing first week doesn’t allow much toying around with your own form. The difference would be that they might try to do that in a “controlled” way, that is purposedly managing it through training, instead of putting up with the rider’s limited output as an unwanted condition. This year Quintana won two stage races, in one he raced conservatively (Tirreno), in the other (Valencia) he was overtly aggressive, even if we are not speaking of long range attacks but “only” from the very start of the last climb. Even last year he produced some aggressive racing, in Romandie and RdS for example. Not at the Tour, nor at Catalunya or País Vasco. However, I find it interesting that, following closely Spanish-language media, it has been *very* apparent that going for the double is Quintana’s decision, while the team would prefer other options and they’re trying to negotiate with the rider and the press some alternative versions. Quintana took advantage of the geographical setting, in Colombia, to play his cards “against”, so to say, the team’s plans. An interesting situation, because neither the team nor the rider like conflict, even less among themselves, but the two “parts” have got very different POVs on the subject. We’ll see. I assumed he had learnt from last year, lost to Froome in July but then came back in the Vuelta (albeit with some help from Contador). I assumed he’d looked at his data and realised he was actually better in the Vuelta… that might not translate to him going full on in the Giro but if he was trying to replicate the results of alst year would need to go fairly hard. +1 Why not try for the double? The guy’s showing the kind of interest in competing that’s been missing lately, though of course Contador tried this too. I really hate the Froome/Sky approach though they’re far from the only ones with this mentality! But I also think the Quintana was stronger at the Vuelta thing is a bit of a misnomer. Legs-wise, if Froome hadn’t made such a hash of that one day (just sit on Q’s wheel, no matter where your own team are dawdling) he’d likely have won by some minutes. I guess the Tour/Vuelta double somehow must not count as a double. I find it hard to look beyond Quintana to win, but would love to see Kruiswijk gain redemption (and stay upright). Personally I’m always intrigued by guys who attempt to make the leap to Grand Tour contender – a hugely difficult thing to do, obviously. Dumoulin has some form in this regard, and I love his character and strength of personality. And might the longish TT’s put him in the mix? Rohan Dennis is now talking a good game. The Yates brothers aren’t a million miles away. Still, my pick would be Quintana for the win and Nibali and Dumoulin to fill the podium. I would like someone to explain to me the point to Cannondale (apart from selling bikes)? They have no riders who can do anything in GT’s and have not won a WT race since the 2015 Giro. I like Vaughters, but I don’t follow his current vision for the team. You could say this about half the WT teams. They have Uran and Talansky, both top 5’s in GT’s. The Giro squad is the young B-team and is clearly lacking. Who does DD have for GT’s or UAE? DD is Cavendish and then nothing, the whole reason they had to plead their way into the WT this year. I wouldn’t call Steve Cummings “nothing” but you do have a broader point. Why does Cannondale do this? What is Vaughters trying to do? Great questions, and I could never really know what goes on in someone else’ mind. However, I am going to take a shot at how I would look at this. JV is choosing to use a small budget to build an exciting team. Sky builds a winning and (sometimes) boring team. JV has a bunch of guys who look like scrappers and risk takers and who stand out from the crowd for being personalities. His brand image is not smothering and winning tours, it is individual effort and quirky bravery. His Giro win fit that model, Talanksky fits that model, his stage hunting style, his strong anti-doping stands (no matter whether you like him, it is part of his brand) are all part of a different way of presenting his brand. From a brand perspective, Sky perhaps wants to govern a race and own it while JV wants to blow it up and own the image of scrappy fighters. If you are a dealer, does this sound just a bit like Specialized vs Cannondale? I am positing that Cannondale and JV are different from the other teams, and proud of it. That this image they have may be working for them in commercial terms. And this is all my own guessing. I undoubtedly agree with your point that JV has created an underdog almost anarchistic team of outsiders. And as a way for Cannondale the brand to differentiate themselves, this makes sense. Every underdog has its day and this probably came when they won the Giro in 2012. However running a professional team, regardless of commercial drivers, that doesn’t aim to win or even compete for the top honors semi-regularly is a strange management style. Sustainable for a short period, but can’ last longer term. He is hampered by payroll. We need to ask him the question what would he do with a theoretical $15M budget, although he most likely would not answer that question as it would obviously cause him personal problems! He does seem somewhat dedicated to an American GT star. Likely for bike sales reasons as Peter has mentioned. That said Hugh Carthy maybe a fore shadowing of the future? Although I would bet he would love to get a contract with Costa! I agree that Cannondale Drapac doesn’t have the same budget as other teams. From previous Inrng posts and other data it is purported that the budgets for top teams were Sky €35m, Katusha €32m, BMC €28m and at the other end Cannondale Drapac – €10m, Former Lampre €10m, FDJ– €11m. I am sure this data is no longer accurate (not that it ever was), but you can see the difference. For the budget Cannondale Drapac has done well, last year they ended up 8th on the UCI ranking, and they are currently 8th or better in the rolling procycling stats team ranking. Thinking about it differently in many sports money makes a difference, it is no secret that Sky has bought many a rider that could otherwise be contending for GC. Also, there are a few teams that perennially really strong with Sky, BMC, QuickStep, Movistar and now Orica – many of the other teams are kind of in the middle – and then there is a drop off to the ProConti teams. Some teams take the sprinter route – but there can only be so many top sprinters… others go from climbing teams, and many add in a gamble on classics. The biggest underdog this year may well be Dimension Data with Cavendish getting kissing disease/mono/EBV. A bigger question is why there are 18 squads in the WT or why there’s a WT in the first place? Other than fee collecting by the UCI that is. In the current situation team sponsors are autocratic governments, bike makers and gambling interests with the odd publishing magnate or mining explosive producer thrown in. Not good. The concept of the best teams by performance being guaranteed slots in the biggest races, rather than being subject to the whims of organisers strikes me as a positive one. Similarly, I can see the value for organisers of knowing that the best teams will show up for their race. So I can see an argument for *a* WT, though not necessarily the one we’ve got now. I’d rather “the whims of the organizer” result in bringing in teams with real interest in doing something rather than WT teams showing up with a 2nd string lineup while their big stars hide out at altitude training camps. I saw much more green jerseys upfront in the last few races than, for instance, Astana’s. So what’s their point? But who cares, as long as the Vaughters haters outnumber the Vino haters for some strange reasons. Doesn’t Geraint Thomoas still think he can win the Giro? Is Quintana riding the Giro a tacit admission that he doesn’t think he’s likely to win the tour even if he focusses on it alone? At the very top of WT racing that kind of defeatist psychology will always be a limiting factor to Quintana’s palmarès. Bring on the Giro! Hands down the best GT of the year, million miles ahead of the snoozefest in July. I am very happy to see that more and more GC contenders target the Giro rather than the Tour. For me personally the spring Classics and the Giro provide most excitement in the racing calendar. From June on it’s just a gradual decline, with the Vuelta being a pleasant exception, although the level is down a notch in comparison with other events in the first part of the season. With the race (the Giro that is) so front heavy, with Etna so early. Do you guys think it will be easier for Quintana to win both races? My reasoning is, if he blows the wheels off everyone on day 4 (right? ), could he not ride defensively for almost three weeks nursing that lead, and thereby giving himself a (relatively) easy Giro, and rather a long time to recover before the Tour? I would be interested in hearing other peoples’ thoughts on this. It’s harder to make a huge difference on an early climb, before the stage-after-stage strain takes its toll. If you succeed, then everybody will know you’re the leader and on the complicated Giro terrain you might be subject to attacks from anybody among the 10-15 riders who will be still in contention, presumably less than a couple of minutes down, that is, the difference we saw in favour of Contador on Etna 2011 (he needed at least the Grossglockner to lock things down a bit more, yet there were long range attacks by Nibali and Contador didn’t get to the Tour exactly fresh); same goes for the hard Alpe di Siusi, an early summit finish in the Giro 2009. A monstre attack like Froome’s on LPSM, destructive as it was (also note that it was on stage ten, after a very demanding first half of the Tour), still left him exposed to attacks during the last week, ultimately having the Sky rider suffering all the way to the end. Froome could seal things a bit more in 2013, with the double impact of Ax3 Domains and the Ventoux: again, he needed to go quite deep to obtain such a result, as we saw in the third week. OTOH, last year everything looked much safer: no strong and race defining attack – nevertheless, the lack of serious attacking pressure by Froome’s rivals was remarkable. It will depend a lot on the competitors. However, the combination of the Etna stage and the *very* hard Blockhaus, before an easy second week and a complicated third week is an unusual setting – few historical landmarks to decide strategies. Last year Nibali was suffering the effects of “GI disturbance” that sidelined Landa and Hesjedal. He was able to fight through it and recover by the last few stages. Granted he would not have won, in this setting, had SK not crashed. But Nibali was forcing the pace and may have partially “assisted” the crash by his aggressiveness. If you review the earlier stages, he lost time through bad luck and a rare tactical mistake, not an overall lack of strength. On the Dolomites stage it appeared he was bluffing to cover his illness and got caught out. His chase back was hampered by lack of tteammates. He also lost a chunk of time on the Alpe di Suisse TT due to a mechanical malfunction. Again, on the stage to Andolo, he bluffed by attacking too soon and paid the price. That is bike racing, as they say. Had he not gotton sick, the race would have played out much differently, I believe. He would not have lost time and maybe have even been in a virtual 3 way tie going in to the final stages where he would have pulled a classic Nibali and attacked on the penultimate climb before a harrowing descent where he took time out of the other contenders and won handily. Just my opinion of course.